Finding a Responsible Breeder – The Enchanted Poodle Club, Inc.
You’ve fallen in love with this smart, funny, opinionated breed. So, once you’ve decided that you are able and willing to groom a poodle, and you know what size you want, it’s time to look for a responsible, ethical breeder. Responsible breeders will spend hours with you discussing their poodles. They will tell you about health issues and discuss the genetic testing done on the parents of their puppies and why these tests are important. They socialize their puppies and begin training them to tolerate the necessary grooming. When you buy from a responsible breeder they will continue to be responsible for the well being of your puppy, and will want to help you with all aspects of poodle ownership. Ethical breeders will ask you to sign a contract concerning the care of your new puppy. As part of the contractual agreement they will have a lifetime obligation to take the puppy back if for any reason you can’t keep your dog, and you will have a commitment to take your Poodle back to them and no where else. The Enchanted Poodle Club will give you information on good breeders in our area. Please contact Nancy Norem at nnorem@comcast.net or Johanna Johanson at johannaj@comcast.net. The Poodle Club of America (PCA) has members who would be happy to help you find a good breeder nationally. Please visit their page here: Breeder Referral Contacts. Today, before you invest in a Poodle of any variety, there are questions you need to ask the breeder about health testing of the parents of your puppy. If the appropriate tests have not been completed, ask the breeder why he/she hasn’t done the genetic tests. It makes sense that a responsible breeder wants to produce the healthiest puppies possible. Therefore you should expect that the appropriate health test, genetic tests have been completed before the dogs are mated. You should expect the breeder to know about health issues in the pedigree of your puppy. The breeder should show you papers stating the test and the results. Recently, EPC was fortunate to have Jack McGillivray come to our meeting to talk about Poodle structure and the PCA’s standard for the breed. Since several members are looking for a puppy they asked about finding a dog who could compete in performance sports. We’re repeating some of the information he gave us for you to think about, too. Mr. McGillivray’s advice was to look for a breeder with an established line and who tests for genetic defects. Breeders who test for health issues and compete are committed to eliminating problems from their line. People who show don’t breed a lot. They do so only when they want another dog for themselves. Because they keep their own dogs, they always want to have dogs they can live with so temperament is paramount for good breeders. As far as having the structure to participate in active sports goes, Poodles that are bred for the conformation ring have the structure to work. Poodles are always energetic and suited to active sports. But, those titles are relatively new. Most breeders with older lines haven’t paid attention to getting those titles, but their dogs are structurally sound and suited for them. Mr. McGillivray referenced one breeder who has champion confirmation dogs who are also top hunting dogs.Mr. McGillivray told us that his dogs are able to easily keep up with him on mountain bike trails because they are sound. How long have you bred Poodles? What activities do you participate in with your Poodles? What genetic testing have you done on the sire and dam? What genetic testing has been done on the grandparents and great grandparents? What are the results of these tests? Ask to see original or copies of the specific tests. The breeder should be able to explain the tests and results to you. Educate yourself on the various health testing for the variety you are interested in. The breeder should know the dogs in the pedigree behind your puppy and be able to talk with you about the dogs in the pedigree. Don’t be overly impressed by the champions in the pedigree. Be tuned in to the structure, health and temperament of the parents of your puppy. Find out at what age the puppies are allowed to go into new homes and what type of house training has been started, and what the breeder has done to teach the puppies to behave for grooming. What training classes or trainers does the breeder recommend? What food does the breeder feed the Poodles? What vaccination protocol does the breeder follow? If they’re local, who is the breeder’s veterinarian? Once you’ve done your homework and you’re ready to get your puppy, then a good, responsible breeder will help you get the puppy that will suit you the best. They’ll talk to you about your life and habits, and know if you want an energetic, busy dog or a couch potato. They’ll know how experienced you are and whether or not you can handle a bossy dog or would do better with a sweet, easy-going dog. If you’ve found a breeder who you’re comfortable with, trust their advice. They want their puppy to have a long, happy life with you. After you get home, call the breeder and ask questions about anything you aren’t sure of with the puppy. Call the breeder to report how the puppy is doing. Your breeder will want you to stay in contact—they put their heart and soul into that puppy. The main work of our club is rescue. It’s something we believe in whole-heartedly. Poodles are a popular breed, and many people buy them without understanding how smart, hard-headed, and people oriented they are. Many people do not understand how much care their coat needs. We love our breed and do not want any Poodle to be homeless, and so, we rescue and look for the best homes. That said, there are many times that getting a puppy or adult from a responsible breeder is a much better choice. 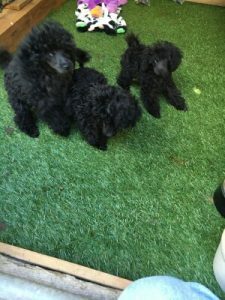 If people are new to Poodles, or even new to dog ownership, it is much easier to get a puppy from a breeder who will support you and educate you about your new dog. Your dog will not have the baggage that a rescue has. Today, we have mandatory animal legislation being enacted across the country to keep unwanted pets from shelters and euthanization. This abundance of unwanted pets is blamed on breeders. In fact, ethical, responsible breeders will have anyone who adopts one of their dogs to sign a contract stating that they will take the dog back at any time if for any reason the new owner can’t keep it. They will often insist that the dog is returned to them even if the new owner has found another home for the dog. To enforce this, they will use one of the new microchips that permits dual pet registration so that they will always show up as an owner if the dog is turned into a shelter. There are always people who will not do the right thing, including breeders who don’t want to accept responsibility for the lives they bring into the world, or people who only want a dog as long as it’s fun, and don’t want to accept responsibility for teaching a pet to be part of their family. Responsible breeders get blamed for the poor behavior of unethical breeders even though they are not the problem. We hope this website will help educate the public to the importance of carefully selecting your dog, training it to live with you and caring for it appropriately. We hope you have learned that a responsible breeder does health testing on the parents, socialization of the puppies, checks out the prospective home before placing the puppies, has a contract that states the puppy/dog can come back to them if for any reason you cannot keep it. Responsible breeders have a commitment to their Poodles that they be placed in the best loving homes, and that they will never wind up in a shelter.